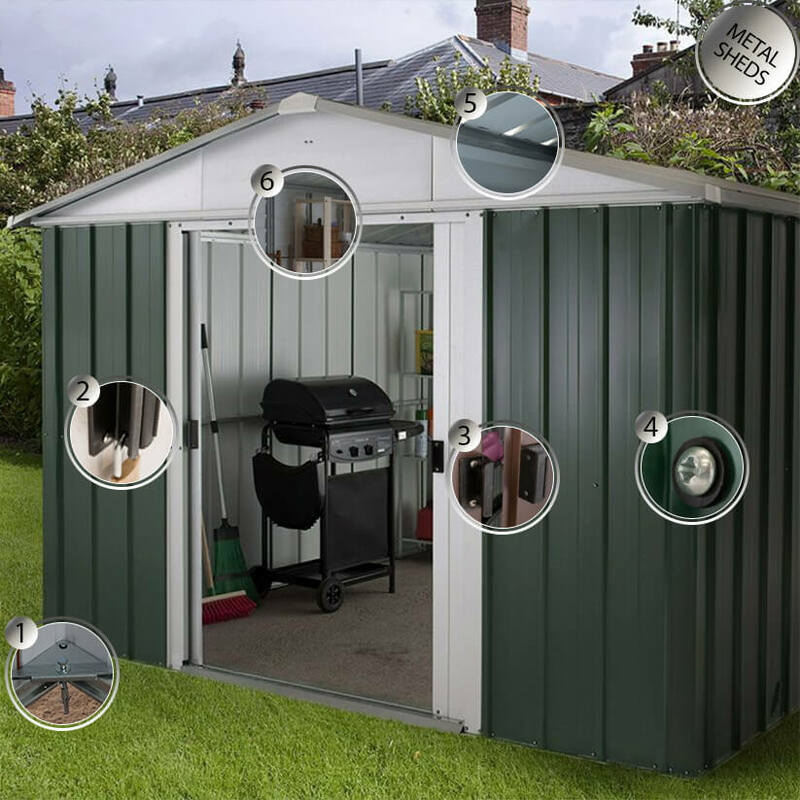 This top-quality metal shed is stylishly designed, built to last and comes with a fantastic 15-year anti-rust guarantee, making it the ideal place to store garden tools, outdoor furniture or bicycles. The 6’ x 5’ Yardmaster Woodview Metal Shed is stylishly designed, built to last and comes with a fantastic 15-year anti-rust guarantee, making it the ideal place to store garden tools, outdoor furniture or bicycles. This top-quality garden shed is constructed from hot-dipped galvanised steel and boasts 7 protective layers, so will never warp, crack or split. Resistant to rust, insect proof, and completely weathertight, this metal garden shed really is as tough as sheds come. The traditional apex roof and stunning baked-on woodgrain finish ensure an exceptionally attractive appearance too, which will endure for years. What’s more, the whole structure is completely maintenance-free, saving both time and money. The sliding, overlapping double doors provide storage-friendly access and outstanding protection against the elements. They include a padlock fixing (padlock not included) and are fitted with anti-tamper bolts, so valuable items will also be completely safe from unwanted attention. The high gables and apex roof allow for plenty of headroom and provide the opportunity to store even the tallest garden tools efficiently, whilst ventilation along the ridge and eaves means that everything is kept in ideal storage conditions. Measuring 1990mm x 2020mm x 1370mm, this 6x5 garden shed comes with an anchor kit, rust-resistant screws, clearly-numbered parts, an assembly manual and UK-based telephone support to ensure a simple assembly.